Building a designing a deck depends on many factors, but how it looks is largely up to you. It boils down to an analysis of your personal texture and color preferences. Mainly predicated by your homes color and how much long term works you want to put into your new deck. Let’s start with wood decking materials. We feel that a vast majority of people will agree that natural wood is the most visually appealing deck surface. The grain patterns, hues and shades of different species all add to woods beautiful and distinctive characteristics. The different variety of woods such as cedar, redwood, cypress, and treated pine products are unparalleled. However, synthetic decking systems have begun to produce products that rival the natural beauty of real wood. Wood naturally absorbs and dissipates solar energy. In other words, you can walk across many wood surfaces that have been in direct sunlight for hours without burning your bare feet. However, the beauty of wood does come with some drawbacks. 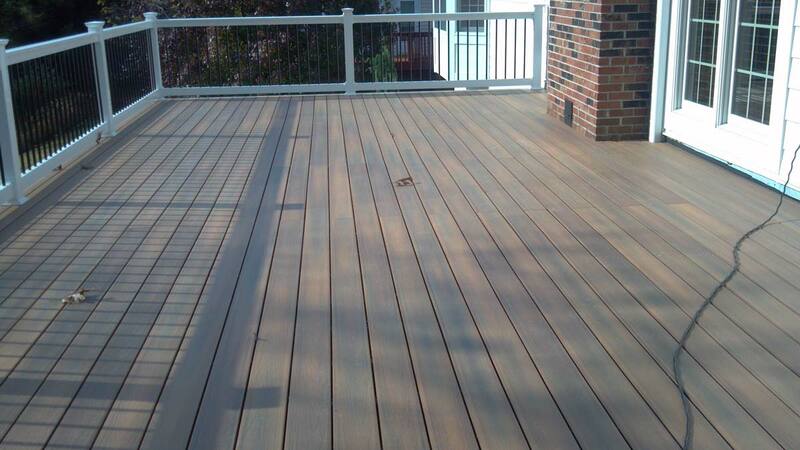 Wood deck surfaces require periodic treatments with synthetic wood preservatives and sealants. These products minimize damage caused by the sun’s ultraviolet rays and water. Synthetic sealants are not a food source for mildew and algae; however, many highly advertised wood sealants contain natural oils that feed these organisms. Even the best deck sealants last only 2 to 3 years before re-treatment is necessary. Low Maintenance: Forget about painting, staining or sealing. Our revolutionary composite decking systems maintain their color and beauty for years without sealing, coating or painting. Resists Heating and Fading: The highly reflective color pigments used in our composite decking systems and railings resist heating and fading caused by the sun. Safety: Unlike traditional wood decks, synthetic decking systems are splinter and skid-free. Durability: Synthetic decking systems will look great for years and they are backed by a 25-year warranty. Increase the Value of Your Home: With our synthetic decking systems, you’ll recoup much of your initial investment when you sell your home. Remodeling Magazine’s 2005 Cost vs. Value Report estimates a national average of a 90.3% return on investment for deck additions*. Call today Oleary and Sons Inc. for a consultation with our professionals and start your decking journey today.